Are consumers not interested or is it too soon to tell? It may be a difficult process, but everybody knows removing genetically engineered ingredients (GMOs) is what all consumers want and is the fast-track to soaring sales, right? We trumpeted "Cheerios Now GMO-Free" in a headline online in January and in our February print issue. Now, three months – admittedly only three months – into the new formulation for its iconic cereal, General Mills Inc. sees no pickup in sales and sounds like it's questioning the rationale behind this move. In a phone interview in late March with the Associated Press, Chairman and CEO Kenneth Powell said the company has received good press, supportive letters and positive online comments for its decision -- but no incremental sales. "It's what I expected," Powell told the AP. He said he was "not really seeing anything there that we can detect" in terms of a sales improvement. And the news organization paraphrased him as saying he believes genetically modified organisms aren't really a concern for most customers. General Mills started shipping only its plain-formula Cheerios without GMOs in January. A spokesman explained the oats part was easy – he said there are no GMO oats in this country – but the company had to find non-GMO sources of corn starch and cane sugar. Post Foods followed up with a Non-GMO Project-certified version of Grape-Nuts. Regular Cheerios seemed like a logical product to try this out on, since its consumer base seems to be concerned mothers, especially ones feeding the cereal by hand to toddlers. The other versions of Cheerios were unchanged. And from the very start, General Mills said it had no immediate plans to reformulate other cereals. Big G used a low-key approach in the rollout, not really trumpeting the change – although it did get noticed by traditional and social media. AP said the reformulation came after a campaign by the group Green America, which prompted fans to express their support on the Cheerios' Facebook page. After the change, Green America noted with some disdain General Mills did not obtain third-party verification, such as from the Non-GMO Project, for its claim. So maybe General Mills did not give this marketing-inspired product change its all. Maybe the reformulation needed a little more time than just three months to be written off. The company could have, maybe should have, gotten official Non-GMO Project certification. It could have made a very big marketing splash over the change – which, however, would have cast doubts on the safety of its other cereals, which presumably have genetically engineered ingredients. Nevertheless, the results are as unimpressive as they are inconclusive. Pretty much nothing has changed. Every food processor, those on either side of the GMO fence, still must weigh the logic of going GMO-free for their products, their markets, their consumers. Another great feature of this month's issue is our annual Capital Spending Report. Capital expenditures are an interesting barometer of the health of the food and beverage industry, and it's encouraging to see our report this year predicting a 15 percent increase in the aggregate figure – at least for the 37 companies for which we have solid figures. They may be only 37 companies, but they're 37 of the largest companies in the food & beverage industry. And collectively they account for $18.5 billion in capital spend. 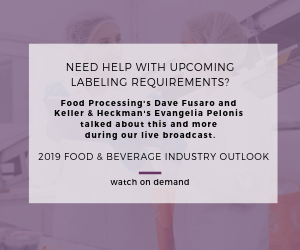 The numbers are encouraging, and the hot product categories and other trends that are driving this investment should be noted by all food and beverage processors. Unsubstantiated or exaggerated claims have no place in this business. Walgreen Co., increasingly a grocery retailer, is considering an offshore home to avoid U.S.
Chairman/CEO says no sales bump, consumers aren't interested.